Though they are well known for making all manner of bejeweled objects, a tiara made by Fabergé is actually a pretty rare thing. They're hard to find, but once identified the delicate detail and high quality craftsmanship is easy to spot. One such example is this tiara of diamonds mounted in silver and gold, made around 1890 by master craftsman August Holmström (1829-1903). Holmström and his son Albert were responsible for much of the Fabergé jewelry made in their time. Graduated arches of old-cut diamonds resting on a diamond band are separated by large individual collet diamonds. Suspended from each arch is a pendant culminating in a large diamond, a pear-shaped stone in the center with a combination of briolette and old-cut diamonds to the sides. The band and the pendants include touches of foliate design, adding just enough flow to soften the hard points of the arches. It's probably best known today as the Empress Joséphine Tiara despite the fact that Joséphine died decades before the tiara was made. It's gone by other names too, such as the Leuchtenberg Diamond Tiara, and it's a hard one to pin down - the tiara has bounced from one owner to the next but didn't really make a mark until it came up for public sale. Nevertheless, the story begins with Empress Joséphine. Joséphine de Beauharnais (1763-1814) was the first wife of Napoleon I. They divorced in 1810 and Joséphine lived at the Château de Malmaison, where her visitors included Alexander I of Russia (1777-1825). The briolette-cut diamonds that rest today in this Fabergé tiara were given to Joséphine by the Tsar on one of his visits (some say as payment for some artwork, though he was also known to present her with gifts). They were high-quality diamonds, of exceptional clarity and size, and were passed down to her son Eugène de Beauharnais (1781-1824), who became the Duke of Leuchtenberg when he married Princess Augusta of Bavaria. The briolette-cut diamonds went to Eugène and Augusta's youngest son, Prince Maximilian (1817-1852), who inherited the Duke of Leuchtenberg title. Maximilian married the eldest daughter of Tsar Nicholas I, Grand Duchess Maria Nikolaevna, bringing the heritage of these diamonds full circle. They were included in the making of this tiara around 1890, and the diadem stayed in the Leuchtenberg family until it was sold in Switzerland after World War I. The sale sent it into the hands of a new royal family: the Belgians. King Albert I and Queen Elisabeth bought it and gave it to their younger son Prince Charles, Count of Flanders (1903-1983). Charles left the tiara to his sister, Queen Marie José of Italy (1906-2001), and she in turn left it to her daughter Princess Maria Gabriella of Savoy. Despite this long history the tiara was fairly unknown and, at least in recent decades, seems to have remained unworn. It's really not so surprising that it next made its way to the auction block. Christie's auctioned the tiara in 2007. Surpassing initial estimates of $788,800 - $1,183,200, it sold for a whopping $2,071,389, the value due not only to the history and the large size and high quality of the individual diamonds, but to the Fabergé mark. 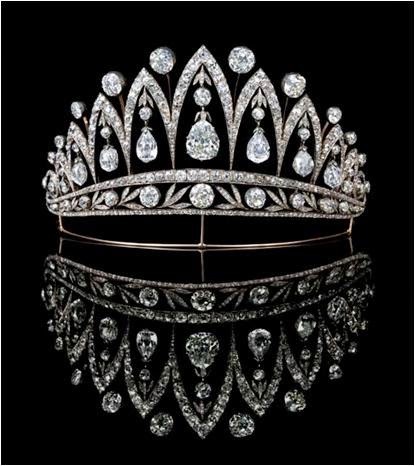 As I said before, a Fabergé tiara is rare - and this one was scooped up by a Fabergé collector. The McFerrin Collection, owned by American collectors Dorothy and Artie McFerrin of Texas, is one of the most important private collections of Fabergé objects. They now count this tiara among their treasures, and have placed it (and plenty of other items) on extended loan to the Houston Museum of Natural Science for exhibit. A can't-miss, if you should happen to pass through Houston. Have you seen this one yourself? Is it a favorite?